Season 36 begins this week (Sep 10-14). Tune in every day to watch the show, or visit this web site to see if your Spin ID was chosen. Winners get $10,000! No scrolling! Just click the arrow button! October 6: I apologize that the site was not updated for the last couple of weeks. To keep it short, I had to go to the Emergency Room and was given five pints of blood. I spent two days in the Intensive Care Unit. etc. I’m back and hope to recover fully. Note that the official web page does not clarify what would happen in the situation that a player successfully acquires the $10,000 wedge, then loses the wedge (on a bankrupt), but still wins the round. The instructions on the official web page are written in a way that indicates there would still be a winning Spin ID in this situation. Probably there will not be any winning Spin ID in such a situation. Important! Apparently The $5K Every Day daily Spin ID contest is dead. If you want, you can send an e-mail message to Wheel of Fortune demanding the immediate return of the $5K Every Day Spin ID contest. September 18, 2015: Teacher Trivia Question: The legendary actor best known for his role as Sheriff Andy Taylor was once a music and drama teacher. Answer: The teacher is Andy Griffith, who taught high school music and drama in his beloved home state of North Carolina. September 17, 2015: Teacher Trivia Question: This star of “City Slickers” and “The Comedians” was a substitute teacher on Long Island. Answer: It’s comedian Billy Crystal, who worked briefly as a substitute teacher on Long Island as he pursued stand up comedy opportunities. September 16, 2015: Teacher Trivia Question: This member of the iconic rock band Kiss once was a teacher in New York City. Answer: The teacher is Gene Simmons, who briefly taught sixth grade in Spanish Harlem prior to co-founding the '70s band Kiss. September 15, 2015: Teacher Trivia Question: This singer / songwriter famous for the fun-loving song "All I Wanna Do" is a former music teacher. Answer: The teacher is Sheryl Crow. Before moving to L.A. in 1986, Sheryl taught elementary school music in St. Louis. September 14, 2015: Teacher Trivia Question: He was one half of one of the most prolific folk-rock duos of the ’60s, and he’s also a former math teacher. Answer: The teacher is Art Garfunkel, who holds a Master’s in Mathematics and taught Math in Connecticut after the release of “Bridge over Troubled Water”. February 13: This is Second Honeymoon Sweepstakes Week! Don’t forget to enter! The daily prize-winning puzzle and a link to the online entry form can be found here. January 30: Fabulous Food Week. Here are the recipes: Worth-the-Wait Lasagna; Very Veggie Tempura; All-in-One Paella; Classic Baklava; Indian Curry in a Hurry. I’ll be providing links to all of the recipes shown on the show this week. December 15: Secret Santa Sweepstakes continues Dec. 15-19. Check the three winning Spin IDs every day! You can also check last week’s Secret Santa IDs. November 6: Many thanks again to Brian, who e-mailed me the puzzles and Spin I.D. for Tuesday November 6 despite every other source on the web (including me) having been pre-empted by hours of guesses as to who might win the election. October 29: Many thanks to Brian, who e-mailed me the puzzles and Spin I.D. for Monday, October 29. Because of him this was the first web site with all of the information for Monday’s show. October 29: It’s “Trick or Tweetstakes” week again this week. Complete directions on how to play as well as the “daily tweet” can be found here. You will see that special page every day this week if you just click on the big yellow button below to step through the regular pages. October 4: Pat said that this video clip of Vanna in a bikini sweeping would go viral on YouTube. So, I uploaded it. Looks best in HD 720 mode! September 20: Daily pictures added permanently to the Picture Index: 9/19, 9/18. 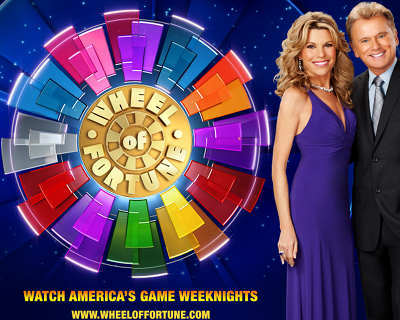 September 14: The new season of Wheel of Fortune begins Monday September 17. September 14: The Forecast Page will be closed until reruns begin again, around the end of May. August 24: Don’t forget: even though Wheel of Fortune is airing reruns until September, there is still a brand new winning Spin I.D. on every show, six days a week, Monday through Saturday. So: don’t forget to tune in to the show or look here after the show to see if your Spin ID is the winner! August 16: From now on, Daily Pictures will be updated every show day (6 days a week) at about 7:45 P.M. Central Time. However, past pictures will continue to be added in to the index slowly. Go ahead and check out today’s pictures! June 19: Reruns have started, so The Forecast Page is up and running again. Impress your friends and family by reading the puzzle clues and solutions before the episode airs and then solve them during the show before anyone else does! July 23: A new set of pages, Daily Pictures, is now active. The idea is to post one high res picture each of Pat, Vanna and the contestants from every show one day after the show airs! I will be adding pictures from the few dozen past shows that I still have recorded when time allows, but it is very time consuming…so please don’t expect past shows to appear soon! May 17: Play Wheel of Fortune Tweetstakes all this week. 50 lucky people will win $500 each. Details, including step-by-step directions, found after the Winning Spin ID page. May 17: CWP Logo image link fixed on all pages for Internet Explorer versions 6 and 7. Apr 23: The Past Spin IDs button is now operational. Please note that only the 2012 Winning Spin IDs are available in the new format. Apr 23: Finally the Past Spin IDs for 2012 is nearly completed. Expect to see that button available on the menu about 9 PM Central Time tonight. Apr 17: Contact Us page “polished” and checked for consistent appearance with 4 major browsers. Now displays correctly in Internet Explorer. Apr 14: Bonus Puzzle page “polished” and checked for consistent appearance with 4 major browsers. Now displays correctly in Internet Explorer. Apr 12: Home page “polished” and checked for consistent appearance with 4 major browsers. Apr 12: Spin ID page “polished” and checked for consistent appearance with 4 major browsers. Past winning Spin ID buttons operational except for 2012. Apr 4: Menu button Winning Spin ID has been fixed. Apr 4: Menu button Contact Us is now working. Apr 4: Menu button My Wheel Audition is now working but still uses the old format. Apr 4: All non-working menu buttons have been disabled. Apr 2: You can just follow the arrows for daily information. For other pages, the menu on the left will take you there. Apr 2: Currently, only the daily pages are displayed in the new format. Other pages will be updated when time permits.